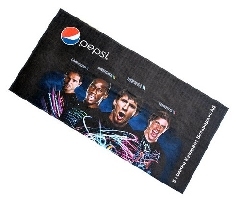 With our new generation towel materials cobined with the very latest in decoration technology processes available we can print "edge to edge"vibrant, full color custom towels . 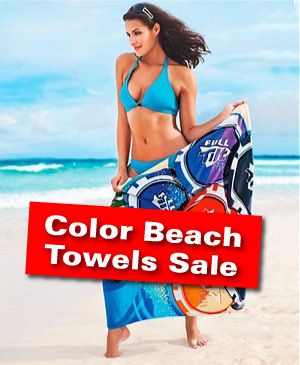 Our unique combination of soft terry cotton and color absorbent microfiber towel material is specially designed to print full color decoration, illustrations and photographs on our promotional beach towels. 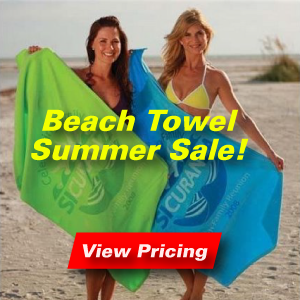 Custom beach towels, logo beach towels, logo golf towels, logo sport towels and even advertising logo bar towels are just a few of the full color towel options that our new generation full color towels are designed to reproduce. 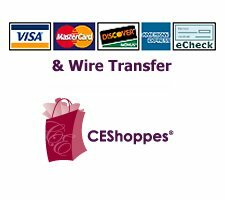 So whether you need to print edge to edge magazine style marketing images or high end illustrations or photographs our new technology full color towels printing can provide the solution you are looking for.